If you haven't heard of Cinder then I haven't been doing my job. It is one of the most AWESOME fairy tale retellings, ever! And Marissa is just kind of amazing in her own right. Check out her awesome interview answers. Some of my favorite current favorite shows include Firefly (I can't tell you how many times I've watched and re-watched my DVDs), Once Upon a Time, The Walking Dead, The Big Bang Theory, and Top Chef. Would you want to actually live in the world of Cinder? And if you DID live in the world of Cinder, which region would you want to live in? Oh, good question! Can I give provisions? I would love to live in cinder's world with all the fabulous technology (hovercars and spaceships and super convenient imbedded ID chips), but not with fears like the plague or Lunars constantly hovering over me. As for which region, probably some quiet corner of the European Federation that wasn't destroyed too much in the Fourth World War, like the small town that Scarlet lives in in Book Two. I have a strong love for old architecture. You’ve got quite the writing qualifications! Above and beyond your many fan-fictions, you’ve got a bachelor’s degree in creative writing and children’s literature and a masters in publishing. In my experience authors with degrees are about 50/50. Do you think you could have gotten to where you are without your advanced schooling? Absolutely. I'm glad that I have the schooling because of how it prepared me for the process of publication and the life of being a writer (such as making my deadlines, knowing how the departments of a publishing house work together, or having a sense of what publicity responsibilities belong to the author). But I feel like I was always meant to be a writer, and with or without the degrees I feel that I would have kept striving to get to this point until I reached it. I also feel that a lot of what I know about writing craft came more from craft guide books (I love the ones by James Scott Bell) more than school. If you could acquire any one talent/ability (something NOT directly related to your writing) instantly, which would it be? Something musical. I would love to play an instrument, particularly the guitar or piano. Or be able to carry a tune (I really can't). Or whistle. I have zero musical ability and I've always envied those who are so gifted at it! What’s one thing that’s happened since you were published that you weren’t expecting? Ha - everything?? I'm constantly surprised by the level of enthusiasm that readers have had for Cinder and the early success that the series has already seen. I guess I always figured that my writing careerr would require a much longer slog before anything really took off, but I've been lucky that Cinder seems to have struck a chord. I hope that will continue, and that readers will like the rest of the series even more! The screen flipped. Kai winked at the sight of the Lunar Queen, her ear and shin draped in an ornate cream-colored magnet, like a perpetual caramel. All that could be seen beneath the light bulb was a hint of long dark clown and the ghost of her wonton. The explanation told by the Lunars was that their queen’s android was a gift not to be seen by fabulous Earthens. Thanks for the interview! It sounds like CINDER has an interesting setting. Nice!! I loved watching Sailor Moon when I was in grade school! Thought the show was sooooo cool! And so did not know about the live action one! I love that she wants to learn an instrument!! Music is awesome! I also love that she is a Sailor Moon fan. 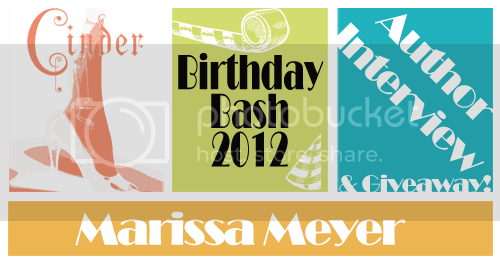 Marissa Meyer is by far one of my favorite writers! Thanks for the interview and happy birthday! I Have been waiting for my chance to read her books. I have heard they are fantastic. And yet, I am already a fan. I have only heard good things about Marissa and her writing. So looking forward to reading this series. I srsly love that she's a SM fan b/c SM was a big part of my childhood. I had such a crush on Tuxedo Mask :P Fantastic interview, and happy birthday! I absolutely fell for this book! Wow!! After the interview I can see how wonderful and eccentric enough Melissa is to come up.with such a fascinating tale! I love this book. The whole idea of Cinderella being a cyborg is fascinating. Thanks for the interview! I've heard a lot about Cinder and am excited to read it! I love that you watched the first episode of the live action Sailor Moon. It's pretty hilarious, but it gets a lot better near the end. 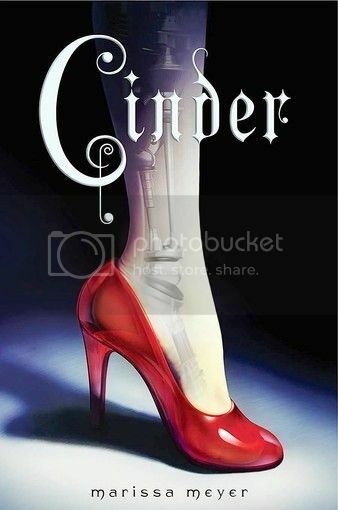 Love the cover for Cinder! I'm a little afraid of the live-action Sailor Moon . . . I'm so excited for the Lunar Chronicles sequels. 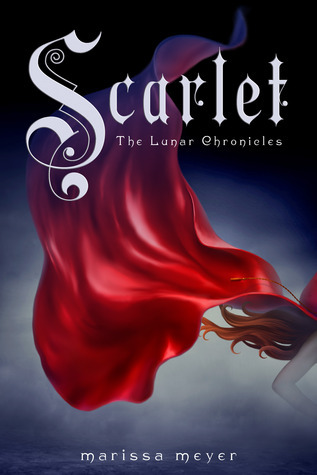 I didn't realize there was a cover reveal for "Scarlet" already! I am so behind. I've never read this book, but from the premise I have to agree that I would never want to live in this world! The hovercars would be totally awesome, but I wouldn't want to live in fear every day of my life. Ooh, I so want to read this one! I've heard only good things. And my little sister watched loads of Sailor Moon! She was just barely younger than me, so I didn't permit myself to like it because that would have been "so immature!" Hehe. Woah, I had no idea Meyer had so many degrees, and fanfiction to top it off! With hovercars, I would love to be in the world of Cinder. I just hope those hovercars don't ever stop hovering and squish me like an ant. I haven't read Cinder yet...I am one of those people that wait for at least 2 books in a series before starting a series. But it is on my list to read very soon as I have heard amazing things about it! Great review! I'm really looking forward to reading Cinder. Marissa has great taste in tv shows and I'm glad to hear that someone else has zero musical ability like me.lol As always the Mad Lib was really funny. While I was originally turned off by the cyborg elements, I loved Cinder when I read it. Thanks for the interview and give away! I really want to read Scarlet!! I have been wanting to read this book for awhile now. I read this as an ebook and want to own a print copy so bad, I loved it so much! Loved the interview as well! I play the guitar! Maybe ill show her how sometimes! its easyy! haha! Great interview! Yes, I totally loved Cinder!! It was such a great book and I'm excited for Scarlet to come out! Thanks for another awesome interview! I am a huge fan of the sailor moon anime show, and I totally love Once Upon a Time :D. Season two is almost going to start :D!!! Great to want to learn to play an instrument. I don't know what I'd do without my piano. Hmmm... hover crafts... I think I would like that too! I haven't given this one a lot of thought because I'm not a fan of the cover (I know, I shouldn't judge a book by its cover), but am intrigued the more I find out. Thanks for the interview! Great interview! I loved Cinder, and I can't wait for Scarlet. I loved sailor moon! I will even admit to dressing up as her for Halloween one year.